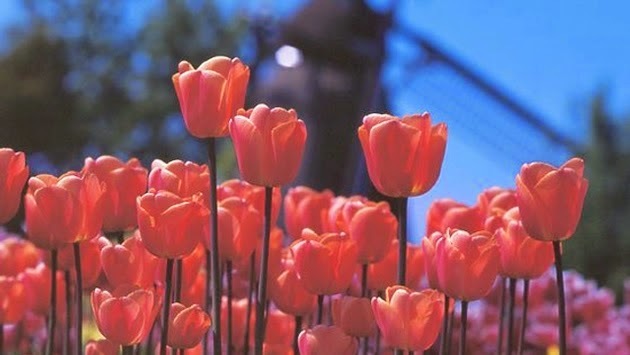 In fact, tulips are one of eight such pillars in the NBTC’s "Discover the REAL Holland" campaign. The others are canals, windmills, Dutch master painters, Delft Blue, biking, clogs and cheese. “All of those icons are very popular with American travelers,” said Shilwala. The beginning of tulip season is almost here. Acres of tulips and other flowers will color the broad flat fields from the end of March and running all the way through May with the peak in mid-April. Tulips are only the most famous of Holland’s blossoms. Depending on the weather, nature’s schedule begins with crocuses in late March, daffodils and small tulips come next, and from mid-April the daffodils and the hyacinths bloom. Finally, from mid-April until the first week in May the tulips steal the show. The center of the annual flower frenzy can be found at the Keukenhof Gardens in Lisse where more than 7 million tulips, daffodils, and hyacinths flood the garden’s 80 acres with color and fragrance. Willem van Gogh, a relative of Vincent van Gogh, opened the 66th edition of Keukenhof Garden last Friday (March 20). The garden is celebrating Vincent Van Gogh this year, the 125th year since his death. The highlight of the Van Gogh year is a 250 square-meter flower bulb mosaic of the artist made up of thousands of tulips. Keukenhof is expecting 800,000 visitors from 100 countries this year. The park is open to the public from March 20 to May 17. “Just about every operator that sells Holland has a package dedicated to the flowers of spring,” said Shilwala. Take Tauck, for instance, the company’s 10-day Holland & Belgium in Spring operates both north and southbound through the waterways of the two countries. Priced from $3,990 per person double land only, the package covers it all from wooden shoes to windmills including such towns as Amsterdam, Rotterdam, Maastricht, Antwerp, Middelburg, and Brussels. On April 6, Emerald Waterways’ new Highlights of the Netherlands & the Beauty of Belgium cruise will sail a circular eight-day trip from Amsterdam through northern Belgium to take in a critical mass of tulips, daffodils, and hyacinth at their peak. The cruise sails the Rhine, as well as the region’s scenic canals. Along the way the cruise also calls at Antwerp, Bruges, Arnhem, and the fishing village of Volendam where some residents still wear traditional Dutch costume, in the town’s old center. Each year, the Tulip Festival in the Kop van Noord-Holland is held in the middle of the tulip fields from late April to early May. Aalsmeer, near Amsterdam, houses the world's biggest flower auction, which is really something to see. The annual Flower Parade (April 25) features 20 enormous floats and 30 cars richly decorated with flowers driving a 25 mile route from Noordwijk to Haarlem.